One of the best picks in this blog is for VinItaly April 9-12 this year in Verona. VinItaly is the largest wine exhibition in the world, and it’s held in the beautiful UNESCO World Heritage city of Verona. 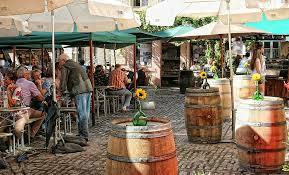 For four days visitors can study, taste, buy and share wine in a gathering that also celebrates food, art, and music. For wine aficionados and amateurs alike, this is a celebration of a Italian wine that you cannot miss. Near Verona is Venice.. also NEVER to be missed if you are visiting Italy. There are some many other festivals of note there… but today is about vino. Just like the wines of Italy, these homes will not disappoint. At midnight on the third Thursday of every November, France erupts in massive celebration in honour of the unveiling of the Beaujolais Nouveau wine. Beaujolais Nouveau, which is a young wine (only 6 weeks old), comes from a region south of Burgundy in France. The arrival of the new Beaujolais is warmly welcomed in France. All over the country, grand traditions have developed in honour of the release of the Beaujolais, with the biggest festival taking place in Beaujeu, the historic capital of the Beaujolais region. After the grand midnight's unveiling, the huge barrels are opened to much fanfare and party-goers indulge in the new wine for the festival’s 3 day duration. In Paris, restaurants and bistros host Beaujolais Nouveau parties, staying open through the night and uncorking hundreds of bottles after midnight. Wherever you may be travelling in France, this is a great night to celebrate life, wine, and a grand French tradition. They offer tours and cooking classes and accommodation. It is rather unique with owners having the opportunity to get involved in the vineyard; spend a day pruning or picking. Or join the vignerons blending. Or simply take friends for a picnic in the vines. One of my favorite countries in the world is Spain. And if you can be there September 21, try to be in Logroño where they organize a ceremony where the new harvest is offered to Our Lady of Valvanera – La Rioja patron. It’s the main date of the festival, and during one week, you can try delicious gastronomic delicacies, watch fireworks, sports and listen to concerts. At San Mateo day 21 September in the park Paseo del Espolon, you can see the ceremony where grapes from different vineyards are carried by hundreds of children and poured into a large wine barrel. These two travel the globe letting us know their thoughts on the best wines that you should be drinking in your home and the best vineyards to be visiting.